The record button in SoundCloud's iOS app is pretty obvious. SoundCloud has become the premier online service for musicians who want to share their work, and its popularity is set to increase further now that it offers built-in audio recording functionality. If you go to SoundCloud's Upload & Share page you'll find that there's now a dedicated Record button: give it a press and then make all the noise you want. The resulting file can be previewed and uploaded or discarded. 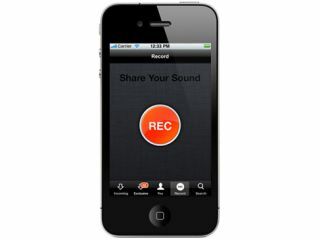 Even better, this same recording functionality is part of the latest version of SoundCloud's free iOS app, so if you're on-the-go and want to capture and publish anything with your Apple handheld device, now you've got an easy way of doing it. To reiterate, then: SoundCloud was great before, and now it's even better.